Three Questions about Compost: Are Ants Good or Bad? Can You Compost Shrimp Shells? & Can We Eat our Pile? | Gardens Alive! Three Questions about Compost: Are Ants Good or Bad? Can You Compost Shrimp Shells? & Can We Eat our Pile? Question. Last summer I noticed lots of small brown ants in my compost bin. This year, the bin is covered in them. I moved the bin and found clumps of larvae throughout the unfinished compost. I'm not sure if this is good or bad; can you shed some light? Ants are probably always visiting the interiors of compost piles for a quick look-see; and it sounds like a Queen may have chosen your pile as a nice place to raise a few thousand young. You probably evicted them when you moved the pile, and the ants shouldn't have hurt the actual compost; ants are one of the many types of creatures who break down organic matter in such situations. But they can deliver an annoying little formic acid bite if they get on you, and you wouldn't want to deliberately introduce a bajillion ants into your garden, if only for fear of their aphid farming habit. You might want to deter them by segregating your ant-attracting green matter like kitchen waste in future piles. 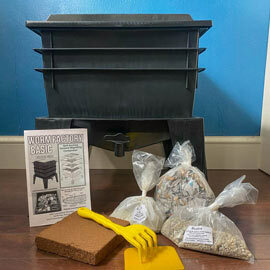 An indoor worm bin is the ideal place to recycle such garbage, especially in Northern areas like Iowa, where the long cold winters create a short outdoor composting season. And the specialized worms in an indoor bin make much higher quality compost out of kitchen waste than even the best outdoor pile can achieve. Shredded leaves alone, or shredded leaves mixed with a high-nitrogen source of green material like coffee grounds or barnyard manure, will make excellent compost outdoors; and I don't think those ingredients would be very ant-attractive. Question. If fish fertilizers are OK, is there any reason not to put shrimp shells in my compost pile? Answer. Well, fish and crustaceans like shrimp aren't even remotely related, Mary; they are entirely different types of creatures. But shellfish shells—shrimp, crab and lobster—are chock full of nitrogen, important trace elements, and some highly specialized nutrients (like chitin) that plants enjoy tremendously. So, although your basic allusion is incorrect, shellfish shells are an even better potential plant food than fish waste. BUT (did all of you hear that 'but' coming?) adding that kind of odiferously attractive material to an open outdoor compost pile is certain to attract vermin of all sizes, from mice and rats to raccoons, who would think they had stumbled onto a pot of gold. Fish and shellfish waste is composted and processed into fertilizer by professionals, but a homeowner who tries it in their backyard will be begging for trouble; potentially dangerous disease-carrying trouble. You could get one of those free-standing sealed bins made of recycled black plastic, line the bottom with hardware cloth of a small enough mesh to exclude mice, and mix a small amount of pulverized shells in with a huge amount of shredded fall leaves; the nitrogen in the shells would help things cook down quickly, and the resulting compost would be of very high quality. But it's virtually certain that vermin would be unable to resist the smell and would start chewing away at the plastic. A compost tumbler whose body is made of metal would probably be better; malicious mammals couldn't chew their way in. READ COMPLETE ANSWER Just remember—these shells are very high in nitrogen and would have to be balanced by a huge amount of well-shredded leaves for the material to become compost. And you wouldn't want to add much—if any—other non-leaf waste to the mix. If you pile up a lot of kitchen waste, it'll just stink and make a mess, shells or no shells. Question. I've read that people often accidentally sprout potatoes and tomatoes from their compost piles. Our pile is growing micro greens of some sort (probably weeds). Are these safe to eat? Everything we put in the compost is organic - and follows "the rules" of composting. Answer. It would be incredibly ill-advised to eat any unknown plant, compost pile-bred or not. If you've got new things actively growing in there, it's not a hot pile; and there are many weeds you don't want to eat. Now, I've had many crops 'self-sow' in my piles. Potatoes are a big one, but they never seem to transplant well into the garden, and I never get decent potatoes when I leave them growing in the pile either. I have successfully transplanted pepper seedlings—both hot and sweet—that appeared spontaneously in piles, and they have routinely done better in the garden than plants I purchased or started myself from seed. This is a good reason to learn what the sprouts of various garden plants look like; peppers and tomatoes are very distinctive looking as babies, and there's no reason not to carefully transplant any pile-born volunteers out to the garden.